If the payment schedule of $250 million per quarter is maintained through 2014, Microsoft will have paid $3.25 billion to Nokia. This is well within the “billions of US dollars” range that is cited above. (The minimum would be $2 billion which would mean payments through the end of 2013). We also need to estimate the royalty payment structure. One figure that has been circulating for a long time is that Microsoft prices Windows Phone (and its antecedent Windows Mobile) at $15/unit. It’s an aggressive price point for a mobile software license and should be subject to volume discounts but let’s assume it’s correct. 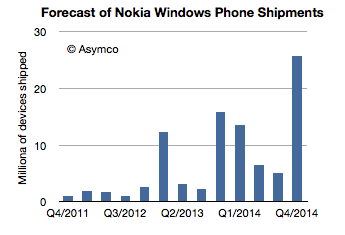 If it is correct then the only remaining question is how quickly will Windows Phone units grow at Nokia? One way to begin is to calibrate WP growth to iPhone growth. For the first two quarters iPhone and Lumia have sold at rough parity. iPhone sold 1.4 million in its first quarter (including opening weekend sales of 270k in previous quarter) while Nokia sold “approximately” one million Lumias in its first quarter. In the second quarter Nokia cited 2 million Lumia units and Apple had 2.3 million iPhone sold in Q4 07. So far Lumia is slightly under the iPhone ramp, but let’s give it the benefit of doubt. This looks like healthy growth, as was the iPhone’s. However, this “iPhone growth” pattern only results in about $1.4 billion in payments in exchange for $3.25 billion from Microsoft, leaving a deficit of $1.9 billion in the “platform support” balance. 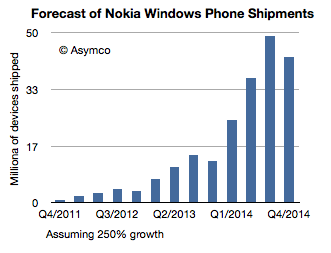 This ramp would result in 210 million Windows Phones shipped over about three years. It would also generate nearly $3.2 billion in “royalties” for Microsoft offsetting $3.25 billion in “platform support” payments by Microsoft to Nokia. There are many assumptions in this, royalty rate and length of contract chief among them, but the key question should be a sanity check: is this a feasible product ramp. It’s certainly far faster growth than Apple has been able to achieve. On average Apple obtained about 160% quarterly y/y growth. It also exceeds the growth rate that Samsung has been able to achieve (165 to 170 million smartphones shipped from a standing start three years ago). It implies 150 million units shipping in the third year of sales and nearly 50 million in a peak quarter. It assumes perhaps as much as 20% market share in smartphones in 2014. It’s certainly ambitious. But even if it’s achieved, it’s only a break-even point for Microsoft’s relationship with Nokia. It would imply that payments to and payments from Nokia would be in balance. The road to (dare one say it?) profitability for Microsoft in mobile would just begin to be visible at that point. What the quote above also reveals is that Nokia is also expecting to pay back some of these “support payments” in the form of “royalty payments” for the software. That’s an interesting word choice as usually an OEM would pay a license rather than a royalty for software. I’m not sure if this implies anything but it may. See also Charles Arthur’s analysis of comparable growth ramps for mobile phone platforms here. This figure was cited “to date” in a March statement so actual calendar Q1 may have been less, perhaps 650k.